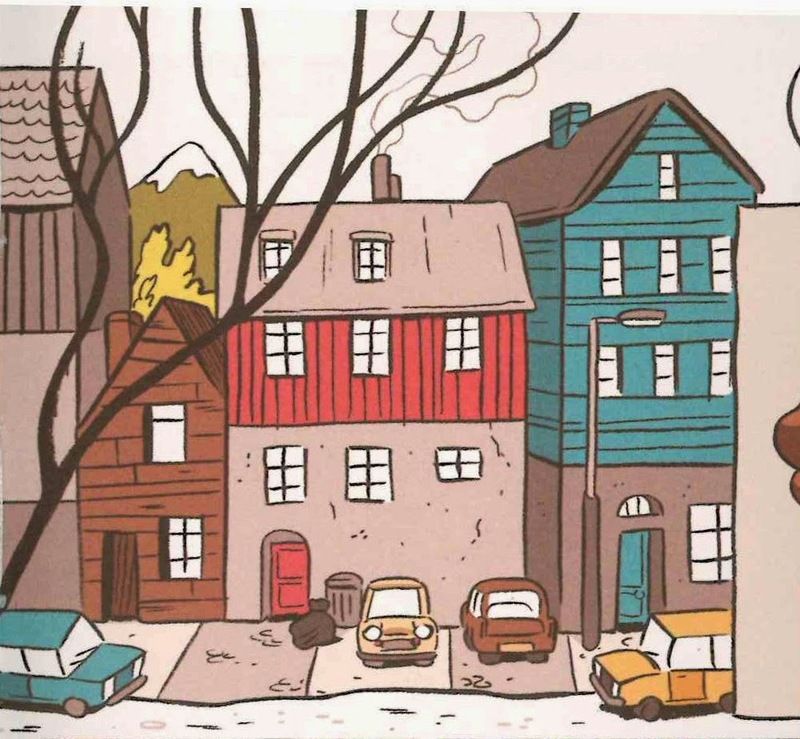 Luke Pearson's Hilda comics are amongst the best children's books being made right now. Coming across such statements of emphatic hyperbole is par for the course in reviews, the meaning corroded by disingenuous over-use, but here it is applicable in the fullest and truest sense. Pearson's blue-haired heroine, here in her fourth adventure, is true bottled magic, the kind of series that ignites kids imaginations and stays with them the course of a life-time, a la Tintin. Hilda's world is one of wonder and magic and yet so very recognisably childlike, as she approaches things good, bad and strange openly, with curiosity, and without filters and umbrage. After having moved to the city in Hilda and the Bird Parade, Hilda is now a little more settled, but suffering somewhat from cooped-in syndrome- roaming around in the city isn't the same as roaming around in the country, so Hilda's mum decides enrolling in the Sparrow Scouts would be a good idea: Hilda gets to camp outdoors instead of in her bedroom, explore and wander to her heart's content, and perhaps even make some new friends. But camping in the great outdoors can't happen straightaway, with skills to be acquired and knowledge imparted, so we get a gorgeous, very funny, double-age spread montage sequence, as Hilda works her way through the 6 weeks of map-reading, (melodramatic) first aid, tent-pitching, knot-tying, and more. Pearson divides each page into 3 sections, ticking a week off each time, with all Hilda's varying efforts ending in mishap or comedy of some kind; it's the epitome of delightful. Soon enough, it's time for the newly fledged Sparrow Scouts to go away for the weekend, despite reports of 'the black beast of Trolberg' a massive, elusive creature (perhaps real, perhaps not) who has been dominating the local newspaper headlines. At the same time, Hilda has other things occupying her mind; namely a 'nisse,' a house spirit without a home, who insists he's been the victim of a miscarriage of justice, and whom she's determined to help. 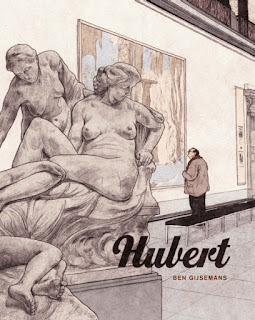 I'm going to stop there in terms of plot, because more than any book you should discover this for yourself, but this fourth Hilda outing feels like Pearson at his most assured yet, particularly in terms of story-telling. 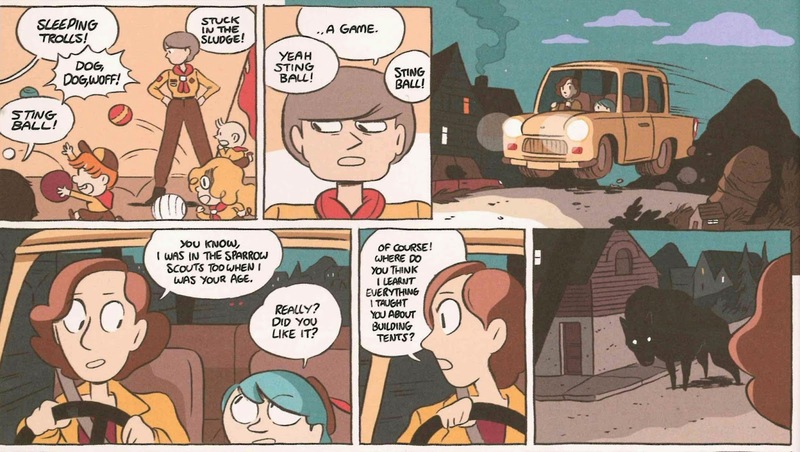 Part of that may be due to Hilda growing up and finding more of a footing, but it felt more solid and complete. 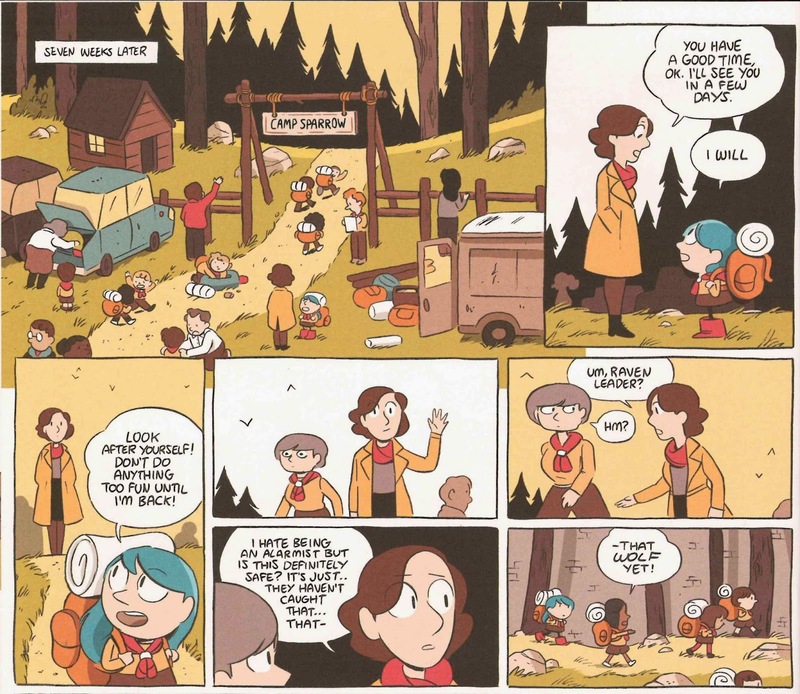 Previous Hilda adventures have seen her interact with mostly her mother and the weird and wonderful creatures she comes across, and here there's a well-executed balance of those more fantastical, magical elements with the grounding presence of other children and adults. That combination of dynamics allows Pearson's to retain the essence of the books and Hilda's personality, whilst introducing new, evolving facets of it, and also refreshing the environment and equation. Another aspect that has developed over the course of the books is Hilda's relationship with her mum, as the reader is shown more of them together. 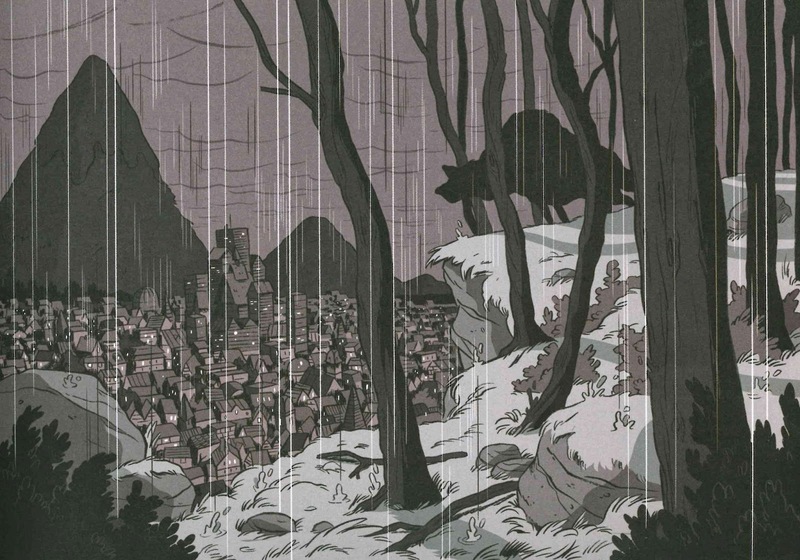 Where Hilda's other adventures have been almost lone-wolf in nature (the question of how much is real and what is imagined by Hilda has been up in the air- partly due to the dream-like location and situations), her mum is present a lot more here; and there's a brilliant bit towards the end where they even team up to resolve the situation at hand. I like the naturalism of Pearson's portrayal, and that he avoids going down the cliche of Hilda 'not fitting in;' the kids are semi-accepting, semi-indifferent, which rings pretty true. It's difficult to describe ability which is so natural and innate it seems pre-existent, organic, what should be -that's how good Pearson can draw- you don't get a sense of consideration, it simply is. If you've not read any of these yet, I would urge you to remedy that- whether you're looking for something for your child to read, or are a comics fan- you will not be disappointed. 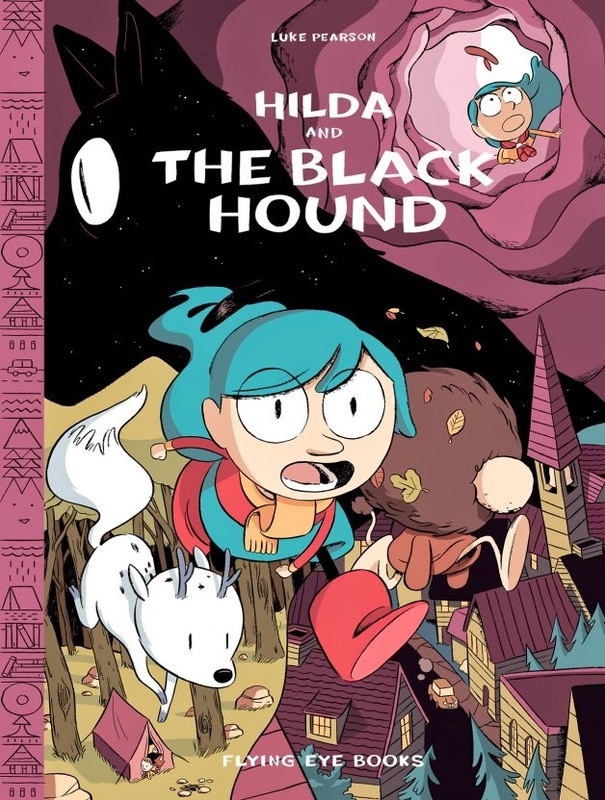 Hilda and the Black Hound is, for me, the most enjoyable Hilda adventure yet- the finest book in an exceptional series.